First lady Michelle Obama smiles at actress and songstress Janelle Monáe at the White House screening of the new film Hidden Figures on Dec. 15, 2016. It was #BlackGirlMagic Thursday at the White House, where first lady Michelle Obama hosted a private movie screening for the upcoming film Hidden Figures, scheduled to come out on Christmas Day. The event included a screening of the movie, followed by a panel featuring the creators and cast members and remarks by Obama herself. Janelle Monáe, Taraji P. Henson and Octavia Spencer, the movie's three stars, were among the notable women on the panel, as well as the author of the book on which the movie is based, Margot Lee Shetterly. Hidden Figures tells the incredible story of three brilliant African-American women—Katherine Johnson (Henson), Dorothy Vaughn (Spencer) and Mary Jackson (Monáe)—who worked at NASA and were the brains behind the launch of astronaut John Glenn into orbit. The trio made history not only as women but as African-American women. During the panel discussion, the audience heard a bit about the lives and stories behind each character, especially concerning Katherine Johnson, who is celebrated in the film as the main source of intelligence behind one of the greatest operations in NASA history. Henson described Johnson as a courageous woman living in a time in history when accomplishments like hers were unheard of. "You're talking about being the first woman in a room of all white men at a time where that was not popular. The courage to even walk in that room with your head held high," she said. "I don't think many people could do that. Just the fear of 'What are they going to think of me?' or 'Will I make it?' The courage just to walk in that room speaks to her fearlessness, speaks to her tenacity, speaks to her brilliance. "At the end of the day, you couldn't take her mind from her. You could call her all kinds of names and belittle her efforts, but she had a brilliant mind that God gave her. And she walked in that. She did not complain," Henson added. The idea of Johnson not complaining was something that Henson emphasized and acknowledged that she learned and took away from in playing the role. "I use that in my life," she said. "I don't complain about Hollywood. I don't say that they don't do this for black women and that and the third; I just keep working because one day you look up and you're a Golden Globe winner, you're Academy Award-nominated, but I couldn't get there by complaining." Dorothy Vaughan, played by Spencer, was Johnson's supervisor, and Mary Jackson, played by Monáe, was an engineer who also worked at the agency. When speaking of these three historic and inspiring women, Michelle Obama underlined the great dedication each had to their field, as well as their ability to maintain their poise during the racism and sexism that they faced at the time. "Now, these women couldn't even drink from the same water fountain or use the same bathroom as many of their colleagues," the first lady pointed out. "And folks didn't always take these women seriously because they were black and also because they were women. … But they didn't listen to those doubters, you understand? They did not listen to the haters." The event was held in front of a small audience, much of it high school and middle school students. And so, fittingly, one of the main themes that seemed to be seen throughout the presentation was the importance of hard work and how far it can get individuals. "What also matters is how hard you're willing to work," Michelle Obama said. "Because none of this is easy, and it's not supposed to be." 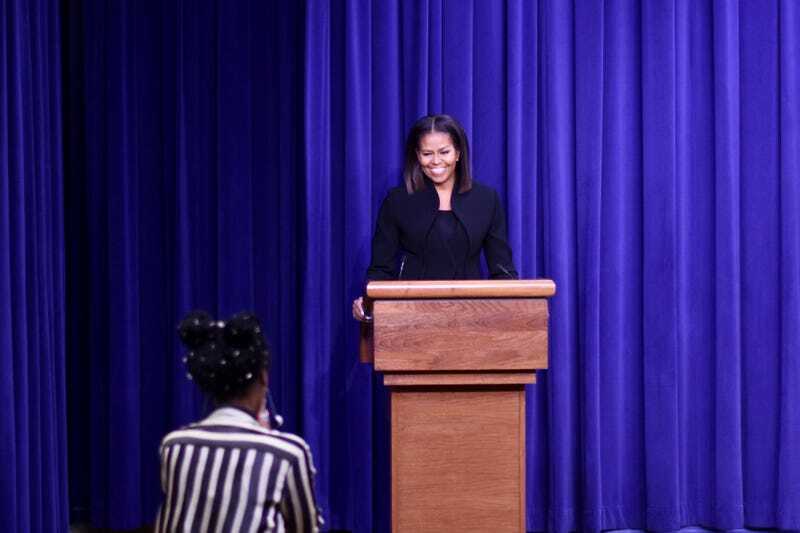 First lady Michelle Obama acknowledges actress Taraji P. Henson (standing, right) at a screening at the White House on Dec. 15, 2016, of Hidden Figures. When discussing hard work, the first lady referenced her own husband, President Barack Obama, and his diligent work ethic and serious commitment to his job. "Look at this eight years," she said. "We were supposed to be 'hidden.' People didn't even want to believe we were real. But here we are, eight years later." Obama further solidified her point, quoting Katherine Johnson toward the end of her remarks, saying, "Stick with it; no matter the problem it can be solved." Veronica Graves is a digital-news associate at The Root. Follow her on Twitter.